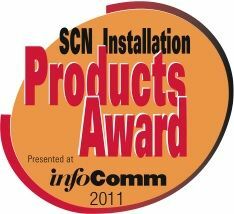 Enter the SCN-InfoComm 2011 Installation Product Awards Today! The 2011 SCN/InfoComm Installation Product Awards have arrived once again. Interest manufacturers should enter their most Innovative Products today. The deadline for Entry Submission from InfoComm 2011 Exhibitors is Monday Feb 28, 2011. Please send one high-resolution image of each product entered to SCN Assistant Editor Lindsey Snyder (lsnyder@nbmedia.com). Winners will be announced at InfoComm 2011 in Orlando, FL, June 15-17. To be eligible for an award, the company must be exhibiting at InfoComm, and the product has to have shipped in 2010. The 2011 SCN/InfoComm Installation Product Awards will showcase the most innovative commercial AV products of 2010. Manufacturers must enter their product or products for consideration before Monday, Feb 28, 2011, so please submit your entry now.